One of the most important elements to add to a washroom facility relates to feminine hygiene. It is crucial to provide your guests or customers with the right equipment to make for a comfortable visit and this means having the correct sanitary towel bins and waste collection services to remove them in a timely manner. As part of our extensive range of washroom services, TWC Group offers feminine hygiene services for our customers. 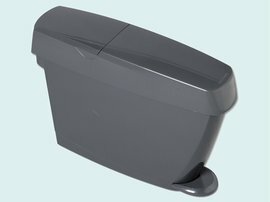 We can provide the latest in sanitary bin products to place in the washroom to ensure that your visitors can have the facilities they required. Just as importantly, we can arrange a timely collection of these bins while providing a replacement. This ensures that bad odours don’t become a problem while people using the bins have a pleasant and clean experience. The bins we provide are stylish and unobtrusive, fitting into any size washroom and offering the facilities that female visitors require. We have compact, space saving designs that don’t create a cramped space within the washroom and their smart appearance means they look the part in the washroom, always a nice consideration. Our discreet service can remove this waste with minimal disruption and we also provide the Duty of Care paperwork, as per regulation requirements. We can arrange a collection schedule that suits your needs based on the number of people using your facilities to ensure the service is cost effective for the business. Your local feminine hygiene services provider. We provide our full range of feminine hygiene services across the whole of North Yorkshire, East Yorkshire, West Yorkshire and South Yorkshire, operating out of our locally based depots situated in Hull and Thirsk. Our feminine hygiene services in North Lincolnshire include our full offering and covers locations such as Scunthorpe, Grimsby, Brigg, Barton-upon-Humber and all the surrounding towns and villages across the Humber region. The feminine hygiene services detailed are available to customers located in the North East region, including cities such as Middlesbrough, Durham, Sunderland, Newcastle, Gateshead and all of the nearby towns and villages.